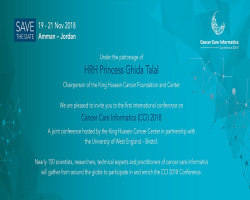 Under the patronage of HRH Princess Ghida Talal, Chairperson of the King Hussein Cancer Foundation and Center, and in partnership with the University of the West of England, Bristol, UK the 1st International Conference on Cancer Care Informatics (CCI 2018) will be held in Amman, Jordan. Cancer Care Informatics (CCI) is the first dedicated international conference on Cancer Informatics attracting researchers, policy makers, and practitioners that employ informatics to empower cancer care holistically, where the cancer patient is the focus in the cancer care journey involving all concerned stakeholders. (6) Methods for evaluating the effectiveness of employing cancer care informatics strategies, policies, etc.